CJAR salutes the four senior judges of the Supreme Court for taking the extraordinary step of publicly apprising the people of this country about the distressing state of affairs in the Supreme Court. The Judges have formally informed citizens of a dangerous pattern which was becoming visible – of the Chief Justice abusing his power as the master of roster in selectively assigning important and politically sensitive cases to particular benches of junior judges of his choice, in an arbitrary manner, without any rational basis. This would have a serious long term impact on democracy and the future of our republic. Though the senior judges did not mention it, but it is clear that the assignment of such cases to certain junior judges was for achieving a particular result, which in most cases can be seen to be in tune with the wishes of the government. The subversion of justice in this manner is particularly dangerous when there is a government in place which is trampling on peoples’ fundamental rights and constitutional values. While some have suggested that this will lower the prestige of the judiciary and undermine public trust, CJAR believes that on the contrary, it was this abuse of power by the Chief Justice of India which was destroying the image of the Court and subverting the course of justice. Exposing this was, therefore, a necessary step to remedy the situation and retain public faith in the institution of the judiciary. Otherwise, as the judges said in the press conference today, history would have judged them harshly for having failed in their duty to ring the alarm bells when the judiciary was being subverted. There are numerous instances of such abuse of the power of the master of roster. A few of the cases, other than the MOP matter already mentioned in the letter of the four judges, where such abuse has taken place are listed at the end of the press release. Though the Chief Justice of India is the master of roster and has the authority to determine benches to hear cases, this does not mean that such power can be exercised in an arbitrary or malafide manner, without any effective consultation with other senior judges. The power of the CJI in assigning cases can only mean that benches would be assigned by subject matter, and if there are more than one benches dealing with a particular matter, cases should go by random allocation. Any other way of construing the powers of the CJI as master of roster would lead to a situation where the CJI himself controls the entire court rather than be the first among equals. The extraordinary initiative undertaken by the four judges provides a tremendous opportunity to usher in much needed reforms in the judiciary. CJAR hopes that appropriate steps will be urgently taken to address the issues raised by the judges. 1. Campaign for Judicial Accountability and Reforms v UOI & Anr. W.P. (Criminal) 169 of 2017. Subject matter: Writ Petition seeking SIT investigation into allegations in CBI FIR relating to conspiracy to bribe in order to obtain a favourable judgment in the case of a Medical College that was pending before the Hon’ble Supreme Court. On 8.11.2017 after the writ petition was numbered, this case was mentioned for urgent listing before court number 2 (since this is the court where mentionings for urgent listing were being taken up and also because it would not be appropriate for the Chief Justice to deal with this matter in his judicial and administrative capacity in view of the fact that he had dealt with the case of the medical college throughout on the judicial side). On mentioning, J. Chelameswar’s bench ordered it to be listed before him on Friday, 10th November. However during lunch the petitioner’s counsel was informed by the Registry that in the light of an order by the Chief Justice this case is assigned to another bench and therefore would be coming up on Friday not before Court 2 but before the other bench. Ön 10.11.2017, the matter was heard by a bench headed by Justice Sikri. The same afternoon the matter was suddenly heard by a Constitution Bench headed by Chief Justice Dipak Misra and junior judges hand picked by him. This was then referred to a bench headed by Justice R. K. Agarwal. Judgement of 1.12.2017, dismissed the Writ Petition imposing a cost of 25 lakhs on the petitioner. Subject matter: Writ Petition seeking SIT investigation on CBI FIR regarding conspiracy to bribe in order to obtain favourable orders in the case of a medical college being heard by a bench headed by the Chief Justice of India. On 9.11.2017 the matter was filed by Ms. Kamini Jaiswal which was mentioned and ordered to be taken up for hearing before Court no. 2. The bench of Justice Chelameswar and Justice Nazeer passed an order directing that in view of the importance and sensitivity of the matter, this matter would be listed for hearing on Monday, 13th November, before a bench of the 5 senior most judges of the Supreme Court. However when the CJAR matter was heard on the 10th of November by the Constitution bench, it rendered void the order passed by Justice Chelameswar, even though the said matter was not before the court. The matter was then listed on 13th December before a bench presided by Justice R.K. Agarwal which by judgement dated 14.11.2017, dismissed the writ petition. Subject matter: Challenge to the appointment of Special Director, CBI. Mentioned before Justice Chelameswar in Court 2, who directed it to be listed before Court No. 3. Accordingly, matter was listed before Court No. 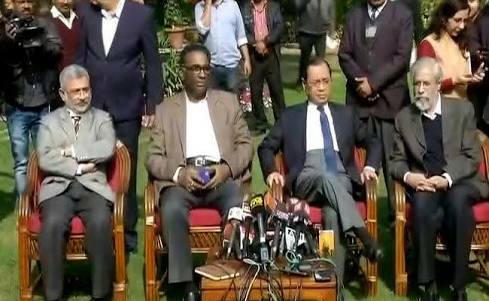 3 comprising Justice Gogoi and Justice Navin Sinha. Justice Navin Sinha recused himself. The matter was next listed on 17th November 2017, before a bench presided by Justice RK. Aggarwal although on that very day Justice Ranjan Gogoi was sitting not with Mr. Justice Navin Sinha but with Mr. Justice R.F. Nariman and Mr. Justice Sanjay Kishan Kaul. The matter ought to have been placed before that Bench. Subject matter: Seeking court monitored investigation into the 2G scam. Earlier matter was being heard by CJI Khehar. Mentioned before Court 2 and order passed by Court 2. On next date, in supplementary list, matter deleted from Court 2 and listed before CJI Dipak Misra. CJI had to recuse since he had dismissed the original petition in Delhi HC. So matter got shifted to bench of Justices Arun Mishra and L Nageshwar Rao. Justice Rao recused since he had earlier appeared in the matter. Then matter got listed before a bench of Justice Arun Mishra, of which Justice Rao is not a member. Subject matter: Seeking transfer of case pending before HC of Chhattisgarh to SC as a similar matter Nandini Sundar v. State of Chhattisgarh (WPC 250/2007) is pending before the SC. Issue: sexual violence and torture of tribal women in the State of Chhattisgarh by police and administration. Both Nandini Sundar matter and Suneeta Pottam were being heard by Justice Lokur who also issued notice in Suneeta Pottam. However, the matter has now been transferred to Chief Justice Dipak Misra’s court. 6. Justice K.S Puttaswamy (Retd.) And Another v. Union of India. W.P. (Civil) No. 494 Of 2012 Subject matter- This case primarily deals with the Aadhar matter. On 11th August, 2015, Bench comprising of Justice Chelameswar, Justice Bobde and Justice Nagappan directed that the matter be referred to a larger Bench. Chief Justice Khehar reconstituted the Bench on 18th July, 2017 which comprised himself, Justice Chelameswar, Justice Bobde, Justice Chandrachud and Justice Nazeer, which then referred the question whether privacy is a fundamental right to a larger Bench of 9 Judges. The privacy matter was decided on August 24, 2017 and at least one of the judges, Justice Nariman, at the end of his judgment, directed that the matters be sent back for adjudication to the original bench of three judges in light of the judgment. The Bench constituted to hear the Aadhar matter now comprises of Chief Justice Misra, Justice Sikri, Justice Khanwilkar, Justice Chandrachud and Justice Bhushan to the exclusion of the other judges who were hearing the matter earlier. Subject matter: Case seeks an independent probe into the death of special CBI judge B H Loya, who was hearing the Sohrabuddin Sheikh encounter case. On 11th January 2018, bench of Chief Justice Dipak Misra and Justices A M Khanwilkar and D Y Chandrachud heard the petition and ordered that it be listed on 12.1.2018. The matter was heard on 12.01.2018 by a Bench headed by Justices Arun Mishra and M Shantanagoudar.